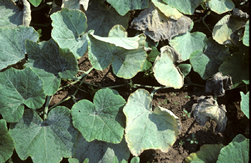 Powdery mildew is a major production problem in cucurbit crops in all parts of the world. All cucurbits are susceptible, but the disease is less common on cucumber and melon due to the prevalence of resistant cultivars. Podosphaera xanthii and Erisyphe cichoracearum are the two most common fungi causing Powdery mildew on cucurbits. P.xanthii is more prevalent and more aggressive; E. cichoracearum is found mainly in the cooler spring and early summer months. Pathogenically specialized races of P.xanthii have been reported. Symptoms occur on both leaf surfaces, stems, and petioles as white, powdery fungal growth. Symptoms develop first on older leaves, shaded lower leaves, lower leaf surfaces, and on older bearing plants. Infected leaves shrivel and die; plants may senesce prematurely. The pathogens are obligate parasites and cannot survive in the absence of living hosts; initial inoculum for the Northeast is most likely airborne conidia originating in southern states. Other possible sources include greenhouse grown cucumbers and alternate hosts. 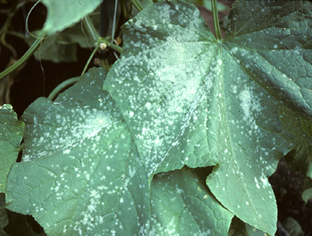 Under favorable conditions, Powdery mildew develops rapidly; the time between infection and symptom expression can be as short as 3 days and many spores are produced. Conditions favoring infection include a dense plant canopy, low intensity light, high nitrogen fertilization, and high relative humidity (although infection can occur at relative humidity of less than 50%). Optimum temperatures for disease development are 68-80° F; infection can occur between 50-90° F. Temperatures of 100° F or above stop Powdery mildew development. Yields are reduced by a reduction in the number and/or size of fruit. Fruit quality can also be adversely affected by sunscald (due to defoliation), incomplete ripening, reduced storability (winter squash), and poor rind quality or discolored handles (pumpkins). In addition, infection by Powdery mildew predisposes plants to other diseases (Gummy stem blight). Scout fields regularly (particularly lower leaf surfaces) and apply fungicides early in disease development. Thresholds are very low as Powdery mildew spreads rapidly and cannot be controlled once disease is well established. Plant resistant varieties where available. Resistant varieties of squash and pumpkin are under development. Choose planting sites with good air movement and free of shade. Separate successive cucurbit plantings physically to prevent older plants from serving as an inoculum source for main crop. Powdery mildew develops best on the lower leaf surfaces; thus a successful fungicide program requires controlling the pathogen on both leaf surfaces. An important component of fungicide programs are materials which can move to the lower surface (systemic or translaminar). Powdery mildew cannot be effectively controlled by fungicide applications after the disease is well-established. Powdery mildew develops best on the lower leaf surfaces; thus a successful fungicide program requires controlling the pathogen on both leaf surfaces. An important component of fungicide programs are materials which can move to the lower surface (systemic or translaminar). Systemic fungicides, due to their single site mode of action, are prone to resistance development and the powdery mildew fungi have demonstrated the ability to develop resistance to these fungicides: (benzimidazoles (Topsin M) and strobilurins (Flint, Cabrio, Amistar). Managing resistance is an important consideration in selecting a fungicide program. Current recommendations for managing resistance consist of an alteration of effective high-risk materials of two or more chemical classes at 7 day intervals, with a protectant fungicide included in every application. A protectant fungicide has multi-site activity, low resistance risk, and will control strains resistant to the systemic chemical.